Yes, the films arrived, yes one of them was of H-U-G-E value. Before I spill on the information in the film, let’s lay out the background information, in order to understand the significance of what was found. In genealogy, there is something known as intergenerational proof. This is proof that a given person was the parent of another. It seems so obvious to us all now, I know who my mother and father are, and I can prove it with my birth certificate. But what if that record was destroyed or never existed in the first place? How would I prove that I was their daughter? Intergenerational proof can be easy to find, such as when a will names all the children; it is especially handy if the parent bequeaths to women who are already married and is specific, e.g., “I, Joseph Tallchief, give my best feather bed to my daughter Agatha Andreyovich Tallchief, now the wife of John Anderson”. Because that happens all the time! Yeah, dream on. It is rare when a will is found and it so specific that it names everyone in the decedent’s family and their relationship to the deceased! Hence intergenerational proof is often built in pieces. Frequently records are found which strongly suggest, but never quite say things flat out. Enough of them can provide evidence that certain people had a relationship which strongly suggests that they were parent and child. Obviously, this was not recorded anywhere and must not have been known to the author of “Jedediah Brown” information. Of course now it is known and all those Jedediah Brown proponents have to stop asserting that. They really do have to stop. Now, are you ready for what was in the Probate file? Well, if you are ready and have not quit reading this altogether, here goes. Well almost, a little more background is needed. 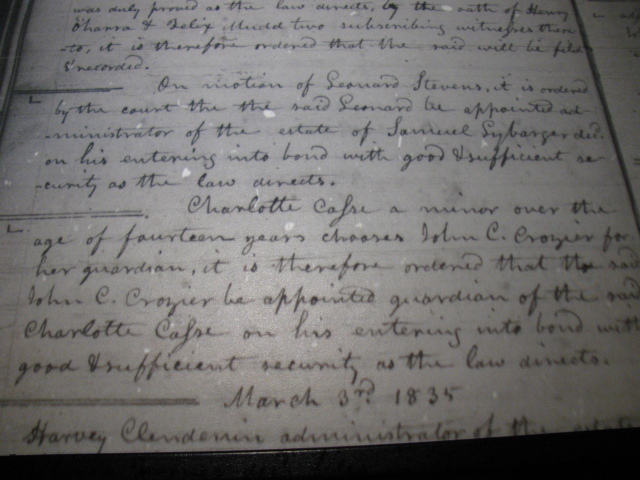 Until the Probate record was examined, we had circumstantial evidence that a man enumerated as Jonathan Case in the Federal Census of 1830 in Randolph County, Illinois was the father of Charlotte Case, Olive Case, Independence Case and Jackson Case and the husband of Catharine (unknown maiden name) who subsequently married W. Callaway McGregor. As an aside, since we are a family of golfers, some of whom are PGA Golf Professionals, that name gives us a chuckle. What are the odds? Notice how I hedged on how he, Mr. Case, was enumerated? Technically, we only know that the name of the man on the census was written down as Jonathan or what appears to be Jonathan to most of us who have read it. On this same page the families nearby include John H. Crozier, in addition to the Shelton Evans family, the William Peach family and the William, Levi, Jr. and Levi, Sr. Simmons families. In this county and nearby St. Clair and Monroe counties there are other records. There is a marriage record for a Charlotte Case to Spencer Ellsworth, in St. Clair county, a marriage record for Independence Case to Beverly Lindsey, in Randolph County, a marriage record for Catharine Case to W. Callaway McGregor (fore!) in Monroe county. A Charlotte Elsworth married Allen Brown in Lee County, Iowa in 1844. A few years later, there is a census enumeration in District 19, Clark County, MO in 1850, for a Catherine McGregory [sic] born in Indiana. She is living with Charlott [sic] Brown, also born in Indiana, and Charlott’s presumed daughter, Catharine, born in Iowa in 1846. Jackson Case, born about 1830 in Illinois, is in the same household. A few pages over in the same census is a listing for Olive Evans, and family and Independence Lamare and family. There is a marriage record, 9 May 1851, for Olive Case to Washington Evans recorded in Clark County, Missouri. We have no death date for the “Jonathan”, of the 1830 census, and no intergenerational proof that this Jonathan was connected to the aforementioned Cases, no birth date for Jonathan. If he was married to Catherine, perhaps they divorced and he married someone else. There is another Case in St. Clair county, who had a brother named Jonathan, was it he who was enumerated rather than the father of Charlotte, Olive, Independence and Jackson? Can the Probate record help answer these questions? For most non-genealogists, the record is pretty boring, on 16 October 1833, John H. Crozier (remember him from the census?) presents the will of Joshua Caise. 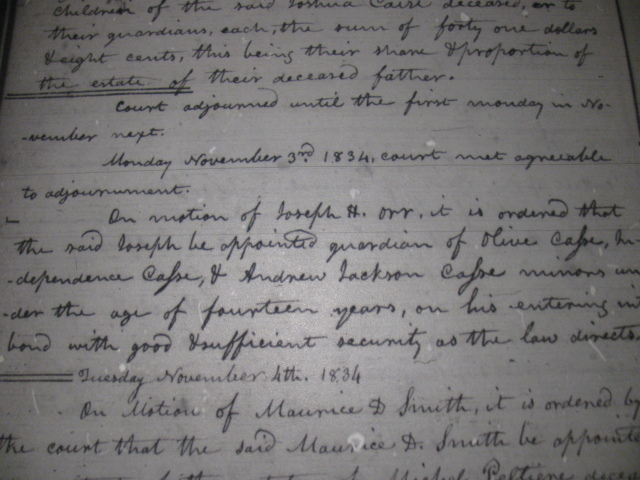 The will was not entered into the record on the same page as this entry from 16 October 1833 and has not yet been located in the Probate Court proceedings. One year later, on the 6th day of October 1834, John C. Crozier renders the account of Joshua Caise, and is ordered to pay the widows share of one third of the estate to Catherine Caise. 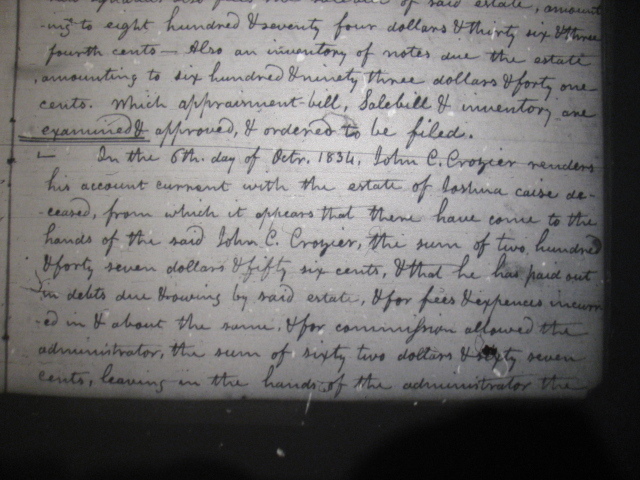 It is therefore ordered by the court that the said John C. Crozier pay out to Catherine Caise the sum of sixty-one dollars & sixty three cents this being the share and portion belonging to the said Catherine of the estate of her deceased husband being the one third part of the nett [sic] proceeds thereof. It is also ordered that the said John C. Crozier pay over to Charlotte, Olive and Independence, children of the said Joshua Case deceased, or to their guardians, each, the sum of forty one dollars & eight cents, this being their share & proportion of the estate of their deceased father. We are still missing a child, Jackson, who was about three years old when his father died. One month later, guardianship of the children is set, at least for most of the children. Two years later, as Charlotte is over fourteen, she may chose her guardian. In February of 1835, she did so. Charlotte’s birth year was thought to have been 1823, if she was fourteen in 1835, her birth year was 1821 or earlier. Meaning that Catherine and Joshua were married by 1820 – 1821. What about this excites a genealogist? 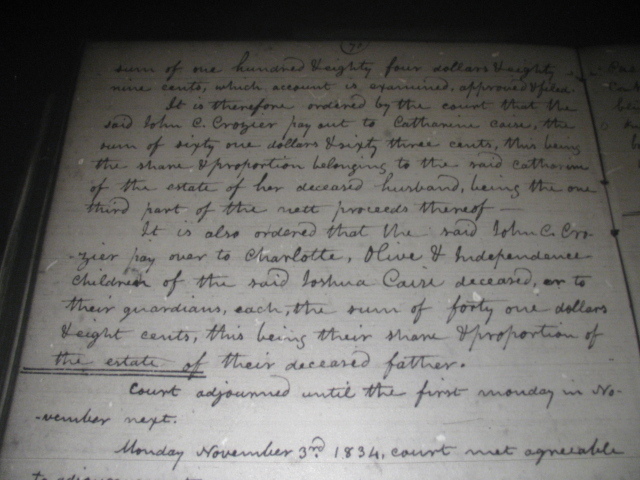 The first examination of the Probate record confirms that Charlotte, Olive, Independence and Jackson, were siblings. It is official confirmation of Jackson’s first name as Andrew. It narrows the death date of Joshua significantly to sometime before 16 October 1833. Joshua was the first name of the father of Charlotte, Olive, Independence and Andrew Jackson Case, not Jonathan, although he may have been named Joshua Jonathan Case. Joshua Case was married to Catherine, who’s surname is not yet known. Charlotte was likely born in 1821, not 1823. The Independence Case who married Beverly Lindsey was the daughter of Joshua and Catharine. What else is interesting? 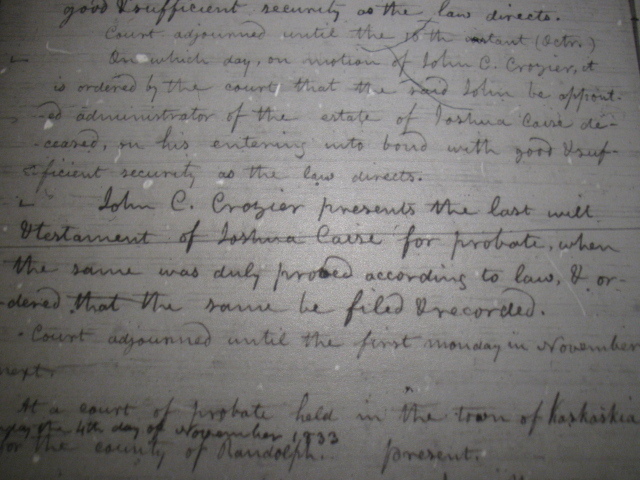 John C. Crozier was enumerated on the same page as Jonathan Case in 1830, which, in addition to the matching family age pattern of Charlotte, Olive, Independence and Jackson, is more indication that this Jonathan is the same person as Joshua and may point to a closer relationship with John C. Crozier or his wife, Mary “Polly” Lindsay, than neighbor. There may exist a relationship to the Joseph H. Orr, which is deeper than some nice reputable guy who was appointed guardian of his children. Don’t confuse custody and care with guardianship, the latter indicated some money management aspect and may have been separate from custody. Lastly, the James Case living next door to Olive Case Evans and Independence Case Lindsey Lemarr in the 1850 Clark County, Missouri Census was not a previously undiscovered son of Joshua Case of Randolph County, Illinois. James Case’s age was 25 in 1850, which may have placed him in the under 5 category in the 1830 census, Jackson may have been not yet born, or as sometimes happened, an infant who was not enumerated. Oh, and my apologies for ripping off a Janet Jackson song title.